Machel Montano HD and his band Xtatik have been the premier soca band in the Caribbean for more than a decade and have established themselves as the leading draw at major events in New York City , Miami , Toronto , and London and throughout the Caribbean Diasporas. Machel is recognized as the leading performer in the soca music genre and is highly regarded as well as a songwriter, producer and band leader. Machel began his career in 1982 at age seven. As early as 1984, he formed his band Pranasonic Express now called XTATIK. Machels debut album TOO YOUNG TO SOCA, released in 1985, was an instant hit which earned him many rave reviews and standing ovations wherever he performed. In 1986, he appeared on Star Search in Hollywood bringing Soca Music to the screens of US National Television. He was described as a Stevie Wonder of Soca. 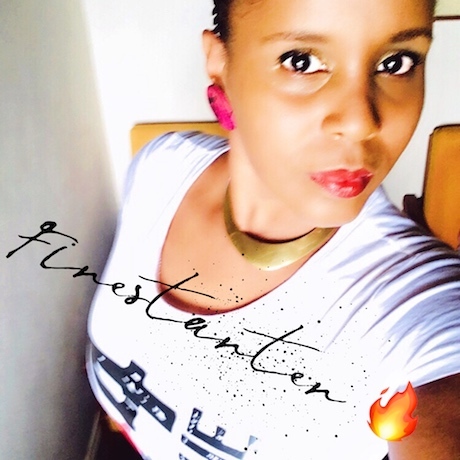 Machel and XTATIK have performed with many popular international entertainment personalities including: Freddie Jackson, TLC, Third World , Shaggy, El Debarge, Destinys Child, The Boyz, Kris Kross, Buju Banton, Ziggy Marley, Garnet Silk, Shabba Ranks, Bounty Killa and many others. In 1987, at the age of twelve, Machel became the first Trinidadian and youngest Entertainer to win the Caribbean Song Festival. In 1991 at sixteen, he won the Young Kings Competition. XTATIK won best playing music band on the road for CARIBANA 94 and MIAMI CARNIVAL 94. 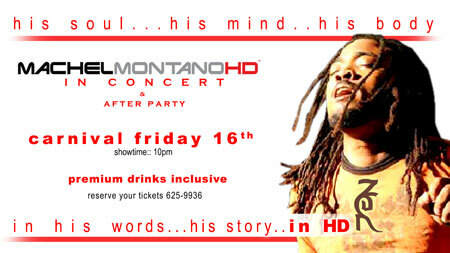 In 1995 Machel won Party Vocalist of the year and in 1996 XTATIK won Party band of the Year. 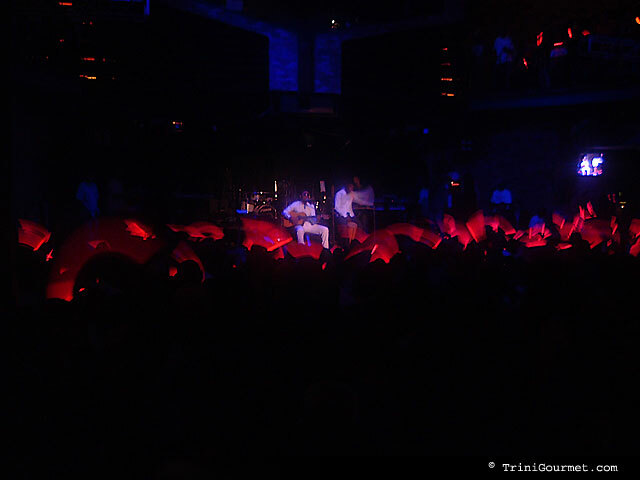 In 1995 and 1997 Machel & Xtatik journeyed to London and mesmerized the sold out crowds. In 1997 Machel became the youngest ROAD MARCH KING of Trinidad & Tobago and XTATIKS album HEAVY DUTY has been described as one of the best selling SOCA Albums ever. 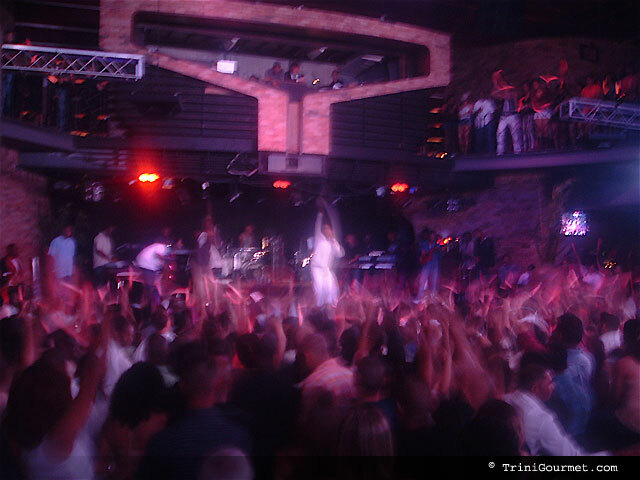 Machel played an almost 90 minute non-stop set… that was pure musical brilliance. The first 1/2 he performed his popular tunes (new and old) in a stripped down acoustic styling (think MTV Unplugged). Many of the uptempo numbers were retooled as ballads crossing several genres and the air was crackling with a feeling of spiritual release and oneness. Tears came to my eyes several times. I won’t lie! For the second half many of the tunes were re-performed in all their uptempo Carnival frenzy. It was like 2 albums/concerts in one! Jamaican dancehall artist Mr. Vegas even made a surprise cameo! It is amazing how every year Machel tops himself musically as both a singer, songwriter and performer, and he is still so young! outta body! back to yuhself now! As I’ve previously mentioned where there’s a fete or nightclub street food is not far away. Friday night was no exception. 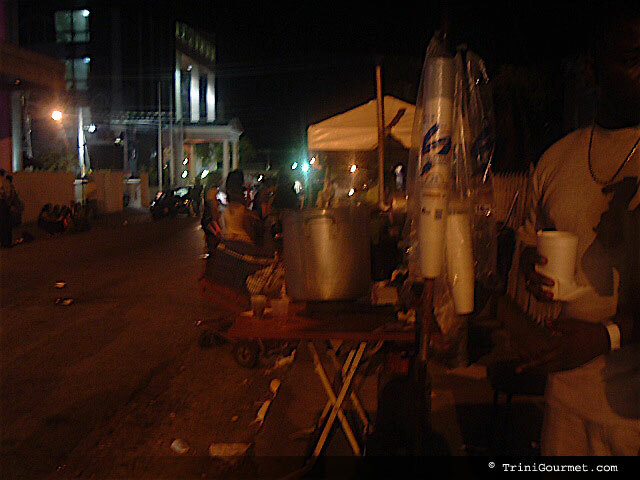 Outside of the nightclub I spotted a corn soup vendor. 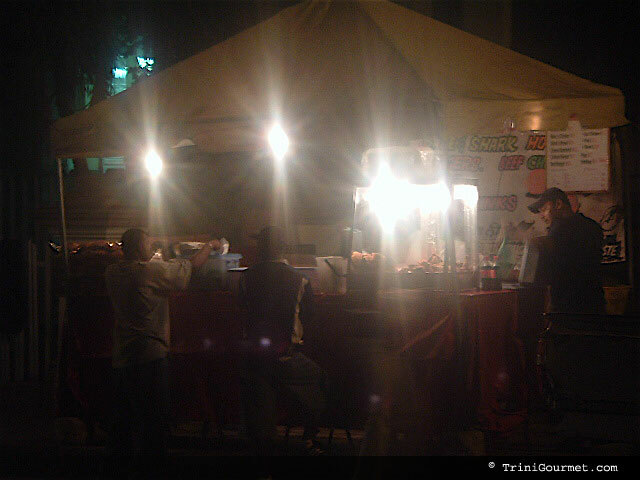 There were also two food stands. 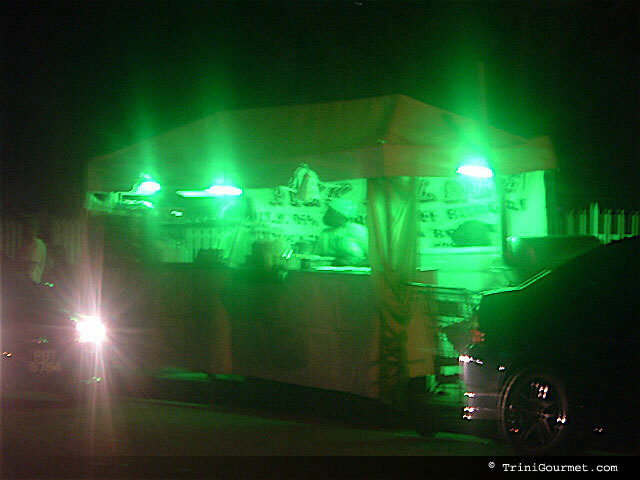 The other’s dubious choice of neon green lighting made it stand out from the crowd, but not in a good way. Does anyone really think yummy and hearty when they see a neon green glow? Guess who we ate from?